Eye-catching in their distinct palettes, spirited brushwork, and abundant compositions, the paintings of artists Katie Batten and Arrington de Dionyso on view within Mirage Guardians at Nationale actively welcome audience engagement. Through a subtle avoidance of the traditional hierarchy between artist and viewer, both open up the canvas as a surrealist-inspired gateway to intuitive interpretation. Humans cavort lovingly with mythical beasts, majestic animals scatter mysterious landscapes, enigmatic symbols hint at secret histories but, yet, any notion of a forced narrative remains at large. The construct of a painting as a singular vision instead dissolves into a fluid carnival for collective reverie and healing. Batten and de Dionyso in this manner both truly delight—their work a celebration of life’s never-ending transitions. More specifically, Batten’s active environments slyly confront the still life convention of a fixed compositional space. While her concise arrangements intimate hidden truths, her canvases are less didactic than theatric in their constant shifting between illusion and objecthood. Taxidermy leopards in cartoonish poses, for example, remind of sphinxes delineating the threshold between life and death. 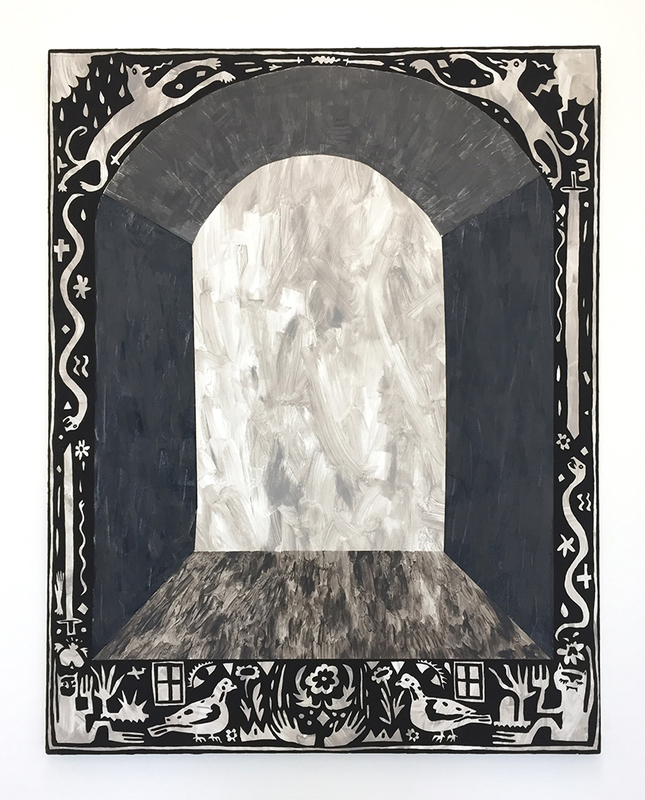 In other works, through loose black and white brushstrokes, Batten jumbles together various scraps of patterns, witchy shapes, and everyday objects into a flattened virtual reality. However, despite this cacophony of visual stimuli, there always remains room for introspection. The lack of any recognizable space enables her works, and the subject matter therein, to move as desired between multiple perceptions. De Dionyso parallels Batten’s predilection for lavish compositions but through a unique aesthetic of lush jewel tones and musical figurations. His subjects—naked men and women, calm yet powerful felines—are captured in loving embraces or languid editorial lineups. Echoing Minoan frescoes, such characters float across de Dionyso’s hazy, monochromatic backgrounds like clues to some long-lost civilization. While also sometimes adorned in ornate costumes and makeup, the effect is less an anthropological record of this “discovered” tribe than a tender family portrait taken by a trusted insider. Morphing into both one another and other creatures, de Dionyso’s figures operate beyond the prescribed confines of both the body and historical narrative. For, as in Batten’s work, symbolism is an illusion and the story is always subjective. KATIE BATTEN received her BFA from the Milwaukee Institute of Art & Design in 2012 and is currently a MFA candidate at Tyler School of Art (Temple University) in Philadelphia, PA. She has exhibited nationally at Artifact Gallery (Seattle, WA), Gallery 1301 (Baltimore, MD), Nomadic Gallery (Milwaukee, WI), Tacocat Cooperative (Columbus, OH), The Soft Arts (Provo, UT), and Stella Elkins Gallery (Philadelphia, PA). She first showed at Nationale in the summer of 2015 with Sarah Mikenis and Jonathan Casella. ARRINGTON DE DIONYSO (born Chicago, IL) is an artist and musician living in Olympia, WA. For the past two decades, his work has been shown nationally and internationally, including at The Smell (Los Angeles, CA), The Department of Safety (Anacortes, WA), Las Cruxes Gallery (Austin, TX), Comet Pizza and Ping Pong (Washington, DC), Septima Gallery (Tokyo, Japan), Fabrica Fluxus (Bari, Italy), Atelier Cardenas Bellanger (Paris France), Festival Invisible (Brest, France), and in Portland, OR, at Disjecta and Work/Sound. His designs were featured prominently on prints and embroideries in Saint Laurent's Psych Rock Collection for Spring/Summer 2015. This August, he will be participating in Supersense Festival of the Ecstatic at Arts Centre Melbourne, Melbourne, Australia.